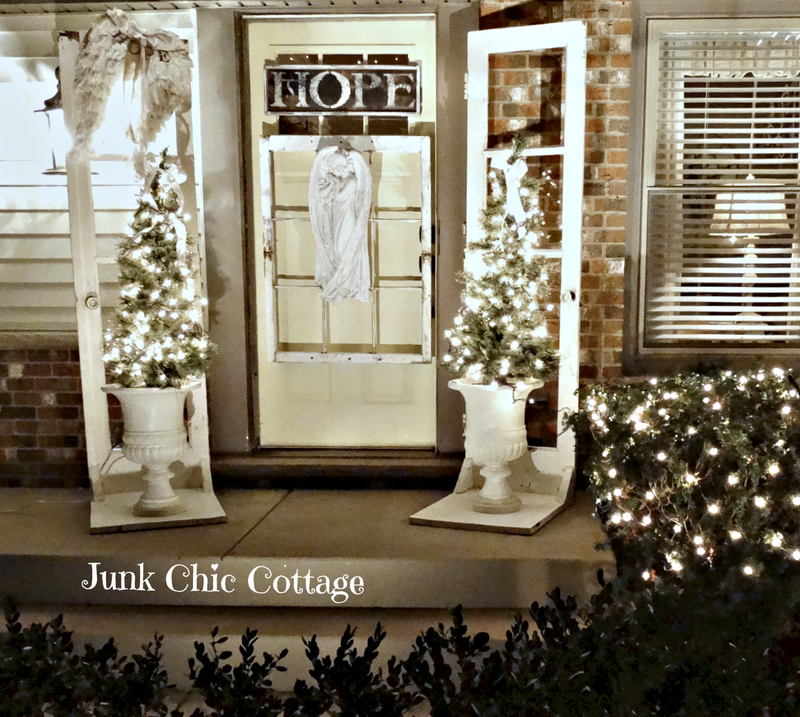 My post today is of my Christmas decor for the front entry into my home. I kept my front entry very simple this year. 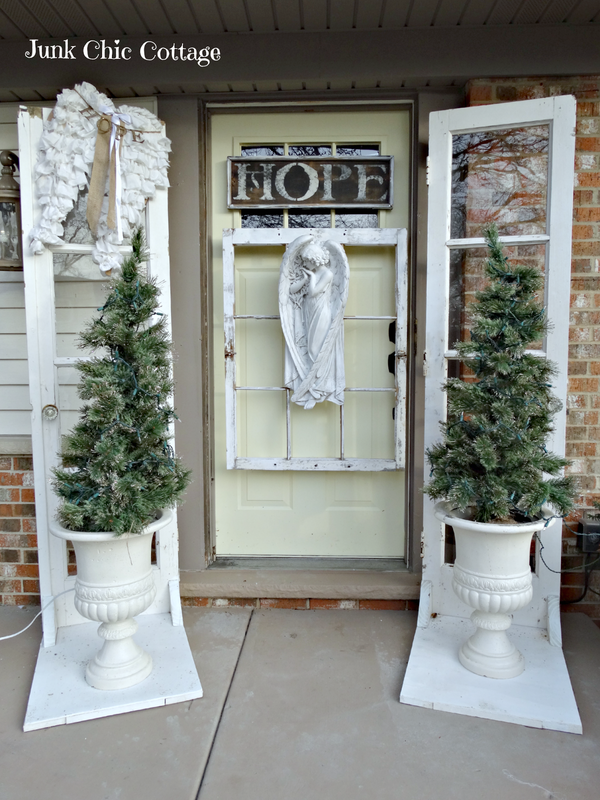 I used by two old vintage french doors I had in the garden this summer to anchor my trees. 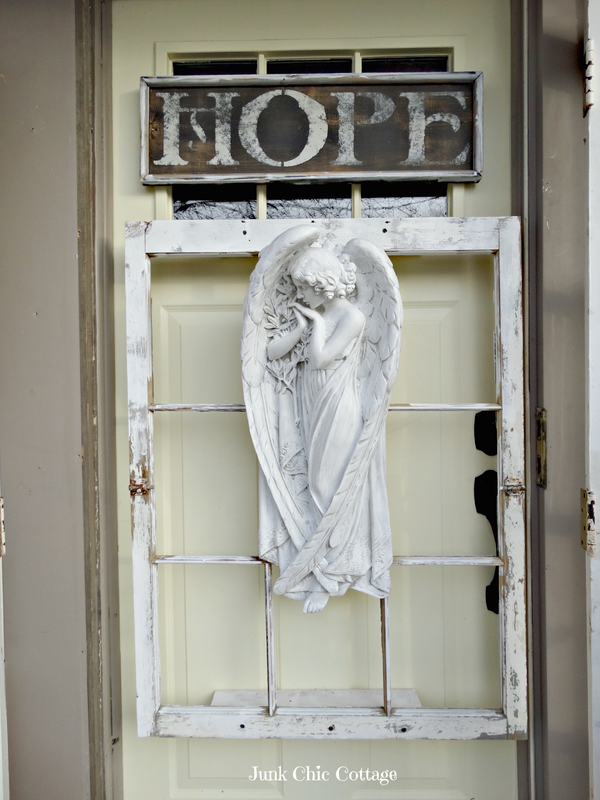 Used an old window to put my angel on the front door. I love the serenity with this beautiful angel. We have not had any snow to speak of yet so some of the fall is still remaining on the ground. 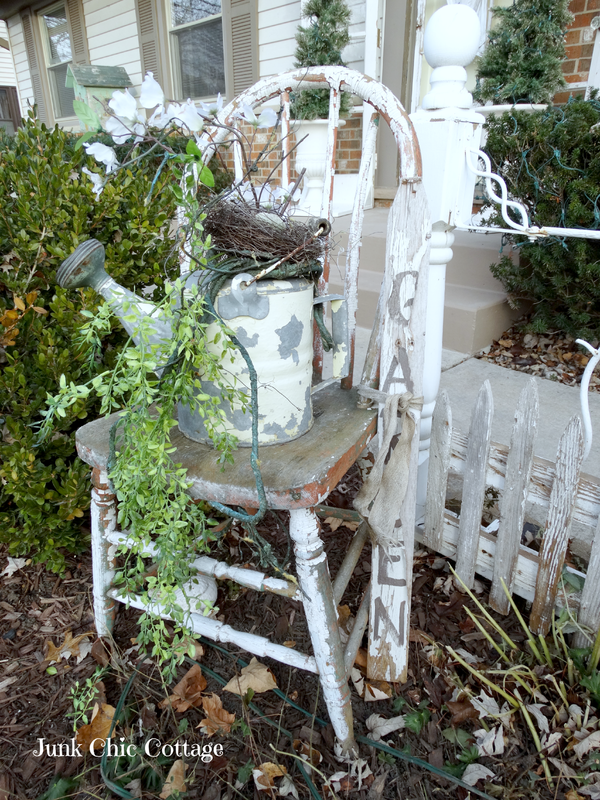 I am keeping some of the chippy vintage garden pieces out front for Christmas. My chippy garden chair and old vintage watering can with greens. 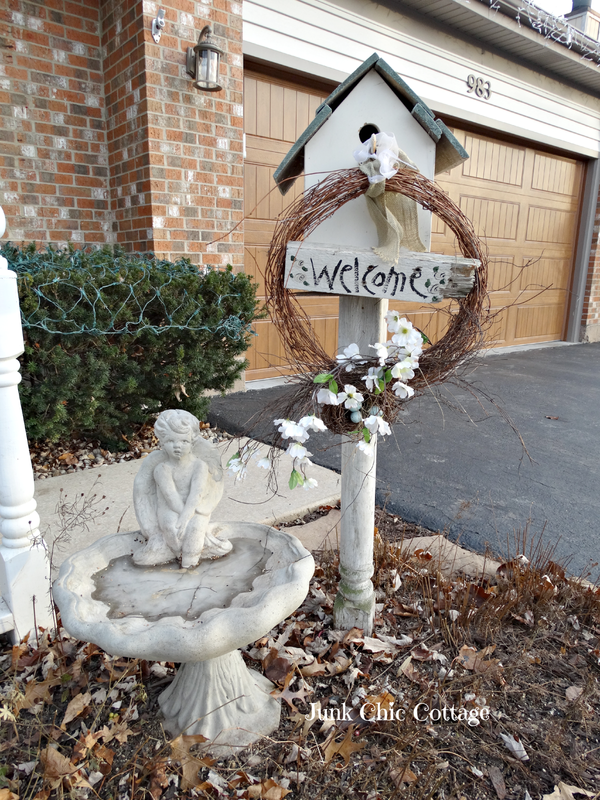 I have my cherub birdbath that I am adding seed too each day for the birds this winter. My old vintage sled that I had as a kid that I painted a few years ago and I added greens and my old skates. Front Entry Way with lights on at night. It is so hard to get a good night shot with all the shadows from the lights. You'll have to take my word that it looks pretty all light up. Happy decorating, shopping, wrapping and baking. The front entry looks wonderful! I especially love how it looks lit up at night. And truly HOPE is what this season is all about. Love the way you used your old skates, and everything is beautiful when it's lit up. We have so much wind where I am that most things topple over on my porch in the winter time so I have to keep it simple. I hope to find an old vintage sled this year to anchor to the cabins wall. What's with this snow thing? I want snow for Christmas, dirty dead grass isn't pretty at all. LOVE that night shot Kris...so pretty! I love how those pretty french doors anchor your trees too! The lights look so pretty at night on your door! The entry is very charming! You crack me up when you say you kept your entryway very simple this year, Kris! 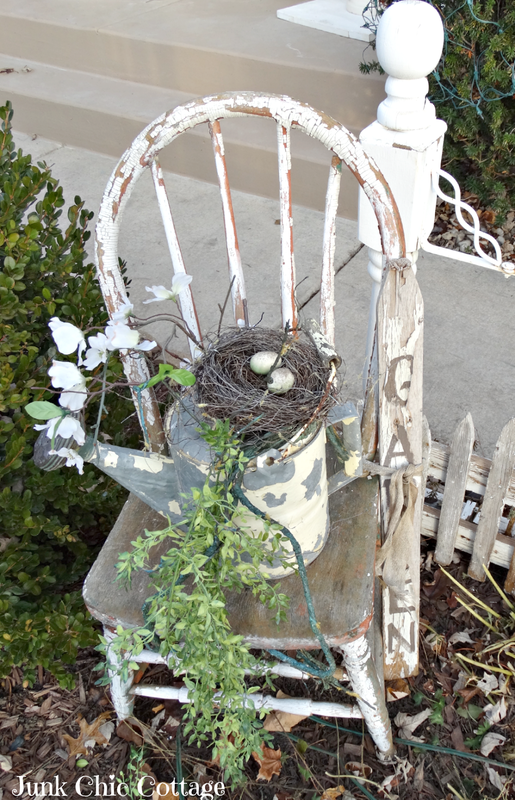 My entryway (front porch) is simple (as-in nothing! ), but your entryway is enchantingly beautifully carefully decorated. I'm in love with that angel, the hope sign, and the angel wings and how everything looks at night all lit up. Enchanting! Kris, I absolutely love your entry way. I love the serenity of the angel and the fact you have it hanging in a window frame. I love the word displayed above it. When you do have snow it is only going to add to the beauty of your decorations. It looks so pretty! I love all the white that you used. It flows nicely with your interior. Just beautiful. I love how you have used the old doors. the doors used to highlight your trees are such a cleber idea, kris! and you have your childhood sled and skates?--that is just wonderful! christmas is coming fast--enjoy! Oh Kris, it is amazing. You do such beautiful work - the decorations are terrific. I love how you have the old doors - they look great. My favorites are the angel and the sled with skates. 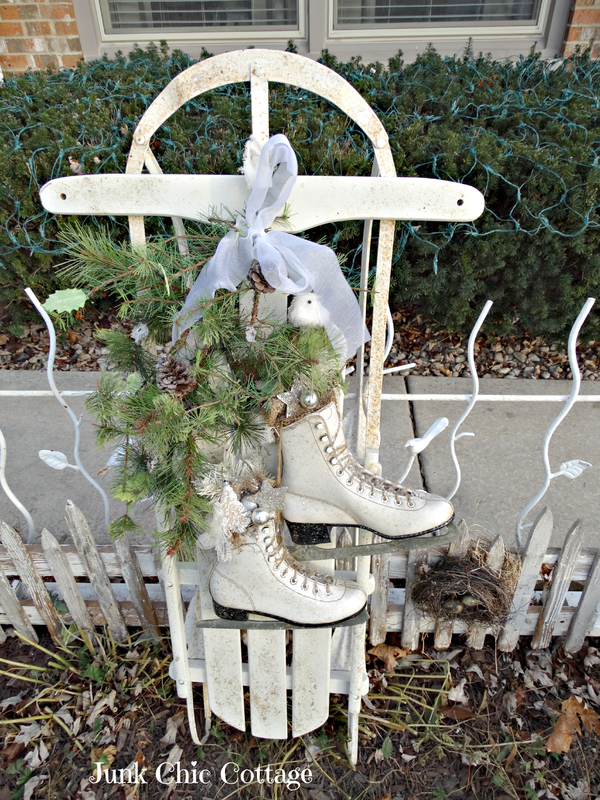 I would love a pair of old skates like that! Hi Kris, love your front entry and the trees in front of the doors. Such a welcoming entrance. 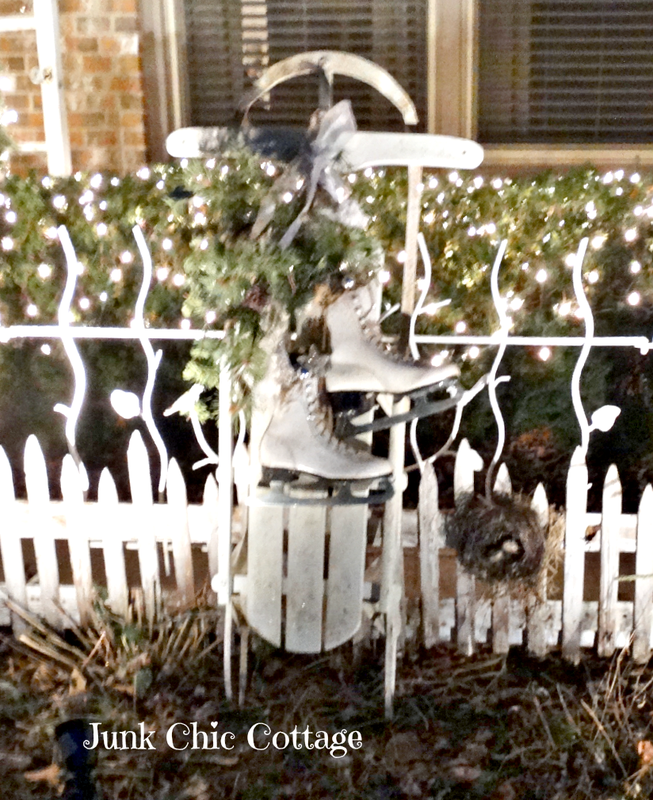 Your garden decor looks perfect and I love the sled and skates. Beautiful .... that's one of the things I miss about not having my house anymore. Decorating outside!!! I have a crush on your chippy chair!!!!! Love the calm and peaceful decor. So elegant all lit up. Love it! What a charming welcome to your beautiful home (love that sled). Kris, love that wonderful little chair with the watering can and that great vintage sled. What a perfect Christmas Welcome! 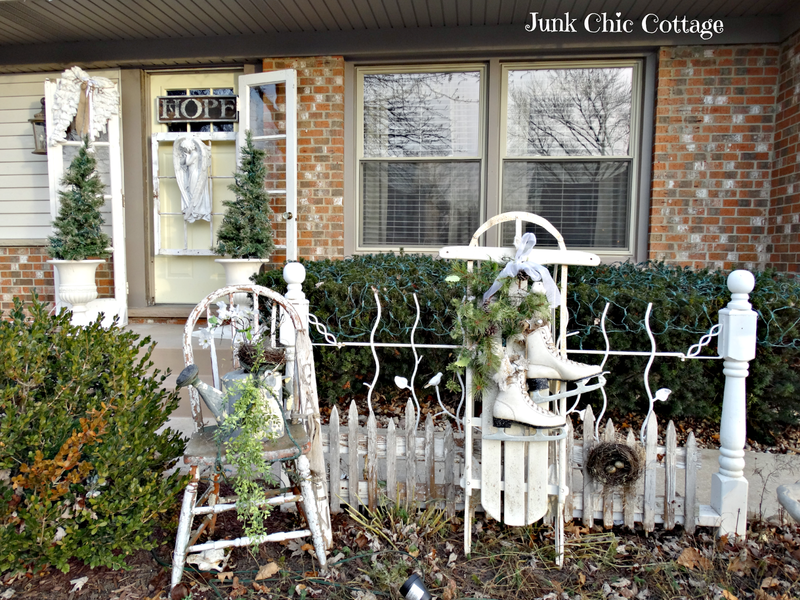 Love your front entry all decorated for Christmas...everything is so pretty!! Your home looks lovely all lit up, Kris! Our snow is almost gone after the rain we had today. I'd much rather have a white Christmas than a green one! So pretty! I just love your sled and ice skates!! So love to come and enter your Junkie Palace and just telling you that this is an absolutely the most beautiful White Palace I seen. I bet it looks so gorgeous at night, it is so hard to show the lights then for me as well. Love how it looks in the daytime! Kris I adore what you did with the front of your home. The doors are such a great addition. So love the sled and skates. I've been searching for old skates for a long time but still haven't found any. Your home is so charming. I adore your door angel!! Wow Kris!....you must have many people stopping in front of your gorgeous home to take in all the beauty!....so many brilliant and beautiful creations!.. Oh, how lovely. The front door is the best I have seen. Really brings the Christmas message home. Your entry is wonderful! I love how you put the French doors on the porch. How fun that you still have your sled and your skates. Mine are long gone. How I wish I still had them. Your entry is adorable. This is lovely, Kris! How wonderful to have your sled from when you were young! Kris, the doors are fabulous and I love the angel! We have had no snow either. As much as I am loving the warm temps, we need snow!! Plus, it's so pretty for Christmas. The picture where everything is lit is so beautiful!